- Net rental income increased to EUR 59.4 million (Q2/2016: 57.0) mainly due to (re)development projects coming online (mainly Iso Omena extension) and the acquisition of the adjacent building to Oasen shopping centre in Bergen, Norway. In addition, positive like-for-like growth contributed to net rental income growth by EUR 0.6 million. The non-core property divestments in 2016 and 2017 decreased net rental income by EUR 1.0 million. - EPRA Earnings increased by EUR 2.2 million, or 5.7%, to EUR 40.9 million, especially due to the growth in net rental income and lower direct administrative expenses. EPRA Earnings per share (basic) increased to EUR 0.046 (0.043). - Earnings per share decreased to EUR 0.03 (0.04) mainly due to fair value losses recorded in the second quarter of 2017. -The company specifies its guidance relating to Direct operating profit, EPRA Earnings and EPRA Earnings per share. -Net rental income increased to EUR 116.0 million (Q1-Q2/2016: 112.2) mainly due to (re)development projects coming online (mainly Iso Omena extension) and the acquisition of the adjacent building to Oasen shopping centre in Bergen, Norway. In addition, positive like-for-like growth contributed to net rental income growth by EUR 1.2 million. The non-core property divestments in 2016 and 2017 decreased net rental income by EUR 3.2 million. -EPRA Earnings increased by EUR 4.6 million, or 6.1%, to EUR 79.2 million, especially due to the growth in net rental income and lower direct administrative expenses. EPRA Earnings per share (basic) increased to EUR 0.089 (0.084). -Earnings per share decreased to EUR 0.07 (0.11) mainly due to fair value losses recorded in 2017. 2) Citycon presents alternative performance measures according to the European Securities and Markets Authority (ESMA) guidelines. More information is presented in Basis of Preparation and Accounting Policies in the notes to the accounts. The first half of the year 2017 was solid with continued strong like-for-like net rental income growth in Sweden and Norway. Like-for-like performance remained weak in Finland as most of Citycon’s stronger shopping centres in the Helsinki area were under (re)development. Overall, like-for-like net rental income growth including Kista Galleria (50%) totalled 1.6%. Supported by strong net rental income and tight cost control EPRA Earnings per share increased by 6 % and we have hence specified our guidance for 2017. We expect the retail sentiment in Finland to continue to improve especially in the Helsinki area as the economy has started to pick up. A clear highlight of the quarter was the opening of the second part of the Iso Omena extension in Espoo. Since the first opening in August 2016, footfall has increased by 28%, even though the new metro line is yet to start running. Especially our new restaurant concept M.E.E.T (Meet, Eat, Enjoy, Together) has been well received and Iso Omena was ranked the most recommended and enjoyable shopping centre in the Helsinki area by Taloustutkimus research company. Recycling of capital and non-core disposals remain a top priority for management. During the first half of the year we have divested assets altogether for approximately EUR 118 million and expect to be able to divest more in the coming year. In Finland, consumer confidence has reached its long-term average for the first time in five years and also the Finnish economy grew last year at its fastest pace in five years. Construction and consumption remain the main factors for growth; however, growth in consumption comes at a time when wage levels have not increased. Exports remain temperate, but are expected to pick up due to the strengthening of global demand. Unemployment is expected to continue to decrease due to the above-mentioned reasons. Retail real estate investment demand continued to be high during the first half of the year, however, transaction volume decreased due to limited supply. This has also resulted in increased yield gap between prime and secondary assets. The Norwegian economy is expected to continue to grow, mainly due to consumption, housing investment and strong export growth. Unemployment is expected to decrease and inflation continues to be high, well above the Euro area average. Retail sales have increased significantly during the last quarter and shopping centre rents have remained stable over the last twelve months. The Norwegian commercial real estate investment volume was the second highest of all time in 2016 and the trend has continued during the first half of 2017 when retail transactions amounted to approximately 22% of the total transaction volume. The Swedish economy continues to display positive signs of growth driven by strong macro fundamentals, strong domestic demand and exports. The growth of domestic demand is expected to be relatively steady in 2017, but exports should provide support to overall growth. In the real estate market, strong investment demand for retail properties and low supply assisted by low interest rates has compressed prime shopping centre yields further during the past year. Additionally, retail rents for prime shopping centres have increased by 2-4% over the past year assisted by strong retail turnover growth. Denmark and Estonia are expected to have positive GDP growth due to private consumption and gradually increasing investment activity. In Estonia, continuous growth of retail sales has been positively influencing the commercial real estate market, which is expressed in terms of higher demand for retail space and reduced vacancies in prime assets. However, in Tallinn the increased competition is expected to put pressure on profits of retailers and additionally cause vacancies to shopping centres with secondary locations. In Denmark, prime shopping centre rents, vacancy rates and investment demand has been quite stable for a few years and are expected to remain at previous levels in the best performing shopping centres. The most significant near-term risks and uncertainties in Citycon's business operations are associated with the general development of the economy and consumer confidence in the Nordic countries and Estonia as well as how this affects the fair values, occupancy rates and rental levels of the shopping centres and thereby Citycon’s financial result. Increased competition might affect demand for retail premises, which could lead to lower rental levels or increased vacancy, especially outside capital city regions. The main risks that can materially affect Citycon's business and financial results, along with the main risk management actions, are presented in detail in Note 3.5 A) and on pages 73-74 in the Financial Statements 2016 as well as on Citycon’s website in the Corporate Governance section. No material changes are estimated to have taken place during the first half of the year in the risks described. 2) The AGM 2017 authorised the Board of Directors to decide in its discretion on the distribution of dividend and assets from the invested unrestricted equity fund. Based on the authorisation the maximum amount of dividend to be distributed shall not exceed EUR 0.01 per share and the maximum amount of equity repayment distributed from the invested unrestricted equity fund shall not exceed EUR 0.12 per share. Unless the Board of Directors decides otherwise for a justified reason, the authorisation will be used to distribute dividend and/or equity repayment four times during the period of validity of the authorisation. In this case, the Board of Directors will make separate resolutions on each distribution of the dividend and/or equity repayment so that the preliminary record and payment dates will be as stated above. Citycon shall make separate announcements of such Board resolutions. The divestment of shopping centre Lietorvet in Skien, Norway, was closed on 7 July. Citycon’s proceeds from the transaction were approximately EUR 13 million. Additionally, Citycon acquired on 4 July the first part of the shopping centre Straedet in Køge in the greater Copenhagen area. The purchase price of the first part was approximately EUR 12 million. Citycon forecasts the 2017 Direct operating profit to change by EUR -1 to 9 million (previously -7-12) and EPRA Earnings to change by EUR -4 to 5 (previously -13-5) million from the previous year. Additionally, the company expects EPRA EPS (basic) to be EUR 0.165–0.175 (previously 0.155-0.175). These estimates are based on the existing property portfolio as well as on the prevailing level of inflation, the EUR—SEK and EUR—NOK exchange rates, and current interest rates. Premises taken offline for planned or ongoing (re)development projects reduce net rental income during the year. 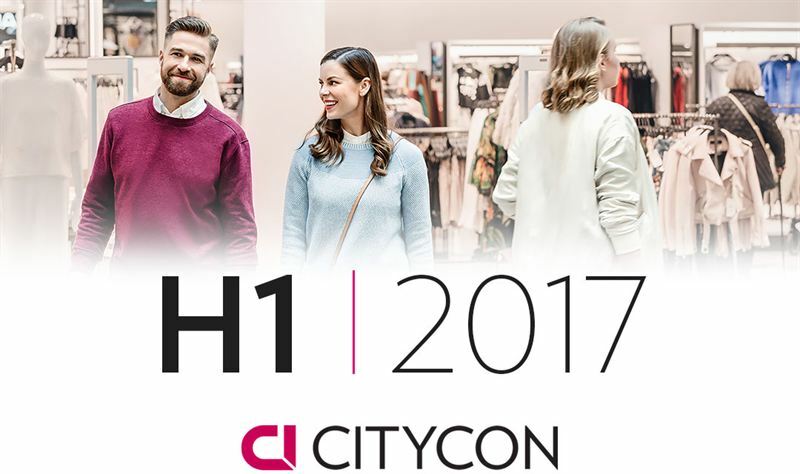 Citycon will issue an interim report of the third quarter, for the period of January–September 2017, on Thursday, 19 October 2017 at about 9:00 a.m.
Citycon is a leading owner, manager and developer of urban, grocery-anchored shopping centres in the Nordic and Baltic region, managing assets that total EUR 5 billion and with market capitalisation of EUR 2 billion. Citycon is No. 1 shopping centre owner in Finland and among the market leaders in Norway, Sweden and Estonia. Citycon has also established a foothold in Denmark.